Moist, soft red velvet cake with traditional cream cheese frosting is just enough to brighten up anybody’s day. Red velvet cake recipe are relatively new as far as the history of cake goes, but they combine the taste of a gooey chocolate cake and the red color of passion and love that makes them special for any occasion. Here is one of the most delicious authentic red velvet cake recipes from scratch that you can prepare at home. Grease two 9-inch baking pans and set aside. Cream butter and sugar using an electric mixer until light and fluffy (the mix will increase in size slightly). Add the egg yolks to the mix and beat for about 2 minutes. Now add the egg white and beat until the mix is well incorporated. In a small glass bowl, mix the vanilla, cocoa powder and red food coloring, and add them to the above mix. 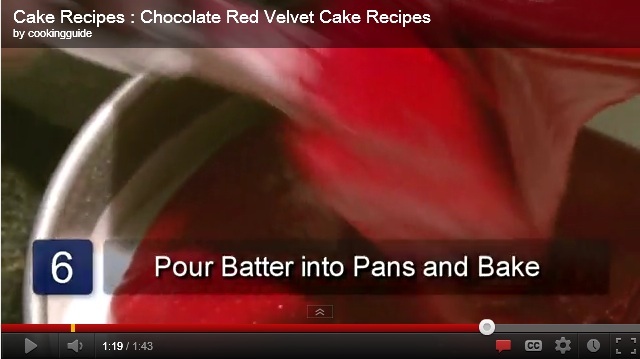 Make sure that the color is mixed with all of the batter. Take half the buttermilk and add it to the colored mix. Beat on a low speed so that it mixes well with the other ingredients. Add half of the all-purpose flour and beat again for 2 minutes at a low speed. In a separate bowl, mix the leftover buttermilk and flour, add the paste to the mix, and beat at a fast speed. Add the baking soda and white distilled vinegar to the mix and beat it for another 2-3 minutes until you get a smooth mix. Tradition says that you use a wooden spoon (and we recommend it) to spoon the batter in the prepared cake tins. Bake the cake in the oven for 30-35 minutes. Check the center of the cake using a toothpick (if it comes out clean then the cake is done). Let the cake cool for at least 20 minutes before cutting it to serve or before decorating using your favorite frosting. 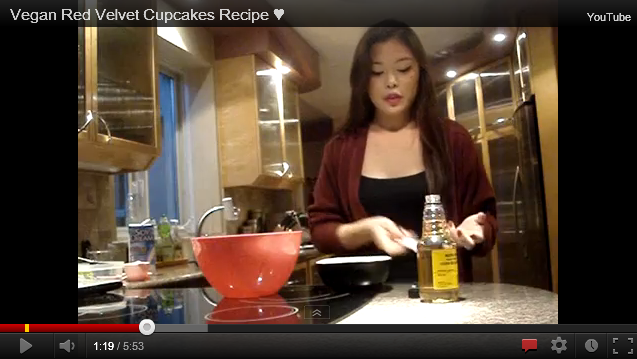 You can also use the same cake batter to prepare cupcakes (makes about two dozen cupcakes). Bake the cupcakes for 20-25 minutes. This is not your usual bundt cake recipe. This is a red velvet bundt cake recipe, which puts a tasty twist on the classic bundt cake recipe made in a round bundt baking pan. If you don’t have a bundt pan, don’t worry about it – you can make this red velvet cake recipe in a regular baking pan or even make it into cupcakes. If you don’t have a lot of experience making cakes, don’t worry about that either – simply follow these easy directions and you’ll be amazed at how easy it was. 1) Firstly, preheat your oven to 350F. Next, lightly grease and flour your bundt pan. 2) In a mixing bowl, combine the oil, eggs, buttermilk, vinegar, food coloring and vanilla. Mix together with a beater until everything is combined. 3) In another bowl, combine the flour, baking soda, salt, sugar and cocoa powder. Now, combine both bowls and mix until smooth. 4) Pour your cake batter into the bundt pan and bake uncovered for about 45 minutes. Once you can poke the cake with a toothpick and it comes out clean, the cake is done baking. 5) Remove it from the oven and allow it to cool for a few minutes before removing the cake from the bundt pan. If you want to add your favorite icing on top, now is the time! About an hour later, this delicious red velvet bundt cake recipe will transform into a cake that is sure to delight even the pickiest of cake-eaters, no matter what the occasion is! 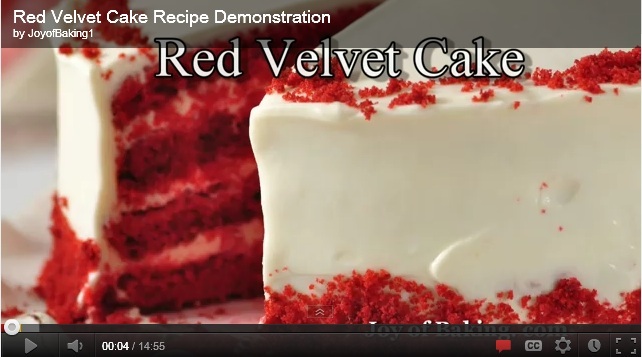 Red velvet cake recipe gets its name from the vibrant red color that it has. The red color is due to the reaction of cocoa powder with vinegar and buttermilk. This color is further enhanced by adding some red food coloring to the mix. 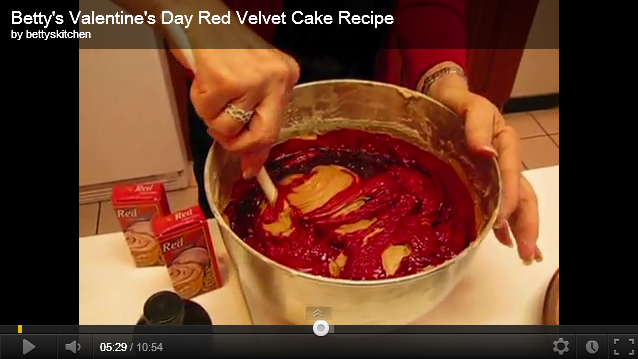 Here is an easy and simple red velvet cake recipe from scratch that takes only about one hour to prepare and cook. In a bowl, sift the flour, baking powder and cocoa powder and mix together. There should be no lumps in the mix. Whisk the egg whites until you get them to a thick dropping consistency. Add the red food coloring to the mix and set it aside. Take the egg yolks and whisk them well until they become slightly frothy. Add the vinegar, vanilla essence, buttermilk, vinegar and sugar to the whisked egg yolks. Blend well using a blender at medium speed. Now add the flour mix, one spoon at a time, and blend well. Ensure that there are no lumps in the mix. Fold the whisked egg whites into the mix. Do not stir too much otherwise it will lose its air. Grease the baking pans using vegetable oil and dust with some all-purpose flour. Divide the cake batter in three equal parts and pour in the baking pans evenly. Once the cakes are done, the tops will be firm but the cake will be soft. Take out of the oven and invert on a cooling rack to cool. Mix the cream cheese with the icing sugar. Mix well. Add the butter to the mix and whisk to get it to a spreading and soft consistency. Add the essence and your frosting is ready. Take one cake, place it on a serving plate and spread some of the frosting on the layer. Place the second cake on top of it and apply frosting to this layer too. Now place the third cake on top of the second cake and cover all the sides with frosting. Cool in the fridge to allow the frosting to set before serving in slices.